Sustainable fashion is definitely a talking point within the fashion industry at the moment. So-called "fast fashion" is now being criticised for its environmental impact, as well as the demands it puts on often underpaid and overworked factory workers. To help alleviate the problem, people are being asked to think before purchasing and to really get the wear out of clothes. As a rule of thumb, if you don't think you'll wear an item at least 30 times, then you shouldn't buy it. 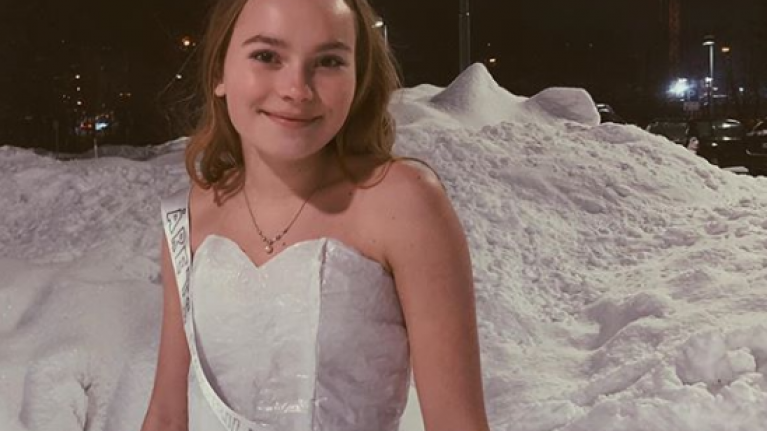 One extremely talented Norweigan girl is taking sustainable fashion to the next level and has proved some serious sartorial skill by creating a dress entirely made out of "what most people would call garbage". She told Instagram followers that the stunning dress is made using just a potato bag for the skirt and cereal bags for the top. "I hope this dress can help show that we do not always have to buy new ones. We just have to get better at seeing all the opportunities we have!" "This year, the school chose not to have a prize for this year's dress, because they want to curb the purchase pressure. I think it's very good! This year, however, I was voted model of the year. For me, that means a lot more." She is certainly a talented lady and has previously attracted attention for a stunning dress she made out of IKEA bags. "I hope that in the future there will be more people who dare to go against the mainstream."